In the 54th issue of the Bed and Breakfast e-Traveller, we take you to the Beaver Valley, one of the most beautiful four season holiday destinations in Ontario. 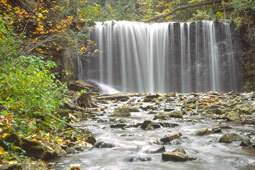 The Beaver Valley, named for the meandering Beaver River, is located on the Niagara Escarpment and designated by UNESCO as a World Biosphere. The Beaver Valley is known for its outstanding natural beauty, for the famous Bruce Trail, and for the beautiful 1900 acre Lake Eugenia created by an Ontario Hydro dam in the early 1900s. 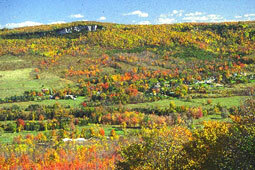 In autumn the fantastic show of colours in the Beaver Valley brings visitors with their cameras from all over. Whether you are hiking up to old Baldy to view the valley at you feet or you stop at a lookout to see the blaze of colours on the ski hills of the Beaver Valley Ski Club or Talisman Ski Lodge, you will be enthralled with this breathtaking display of mother nature. 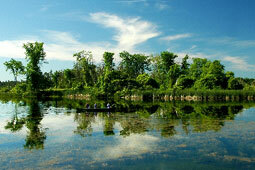 You may decide to take a canoe trip along the Beaver River or to canoe or fish at Lake Eugenia. In the fall, this hidden jewel of a lake is a photographer’s delight with the play of colour on the water, and the beauty of sunrise and sunset. In the fall hundreds of wild fowl, geese, ducks and gulls, stop over to gorge themselves before their long flight south. You will also see and hear the loons and see the wild heron. Beaver Valley is a birder’s delight with many varieties of birds and hundreds of hawks circling over the valley near Kimberley. Visit one of our Bed and Breakfasts in Beaver Valley Accommodations and let our hosts pamper you and guide you to the many activities in the area. Fall is an exciting time for children and families to visit the local fall fairs or to go apple picking in one of the many orchards. Enjoy the excitement of barrel racing at the local horse show, have a pony ride, or shop at antique stores and outdoor markets. Beaver Valley is surrounded by the charming towns of Flesherton, Markdale, Thornbury and Meaford and is only minutes from Collingwood. Take advantage of the beautiful fall weather and spend a few days in the Beaver Valley of Ontario.